If you ask anyone to make list of favorite children’s authors, Eric Carle would almost certainly be on that list. His work is both prolific and magnificent. His simple text is brought to life by colorful texture and hands-on appeal. I love talking to children about Eric Carle as we do our bug unit, because he has so many fabulous books featuring bugs! Start off your author study by showing a picture of Eric Carle and introducing him as an author and illustrator. Explain what those words mean, and point out that the children can be authors and illustrators too. Show a wide array of Eric Carle’s books and have the children talk about what the books have in common. You could list these features on a chart paper to reinforce what has been said, as well as the concepts of print. Throughout the unit, refer back to those distinguishing features again each time you pull out an Eric Carle book to share with the children. Stock your bookshelf with a variety of Eric Carle books- not just the bug ones- and let them explore! The Very Hungry Caterpillar is very likely Eric Carle’s most popular book. The fuzzy little character has become as synonymous with Eric Carle as the Cat in the Hat is with Dr. Seuss. This book is fantastically lovable, beautifully simplistic, and easily used to teach a variety of concepts, such as the days of the week, numbers and counting, healthy foods, and life cycles. To experience a taste of Eric Carle’s art techniques, try this multi-day project. First, place a drop cloth under your art table and then cover the entire surface of your table with paper (I actually do two layers to protect against seeping). You could also take the whole project outside and simply tape your paper down on the ground or against a wall. 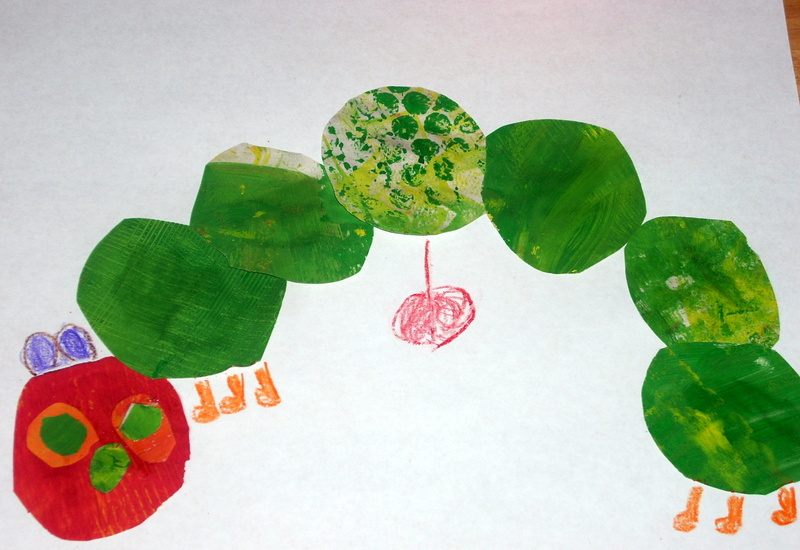 Set out paint colors to coincide with the caterpillar’s body (yellow and various shades of green). You can use paint cups, or use lids to plastic containers like I did here. Set out a variety of tools to be used in addition to the brushes to create different textures as well. Here are some ideas to get you started: combs, dishwashing wands, sponges, texture rollers, print blocks, corrugated cardboard, and bubble wrap. Go crazy! Get creative! Eric Carle uses all kinds of things to create texture- even scraps of carpet! Really encourage the children to cover the whole paper with paint. Point out some of the textures in some of Eric Carle’s illustrations and ask the children what kinds of textures they can create. 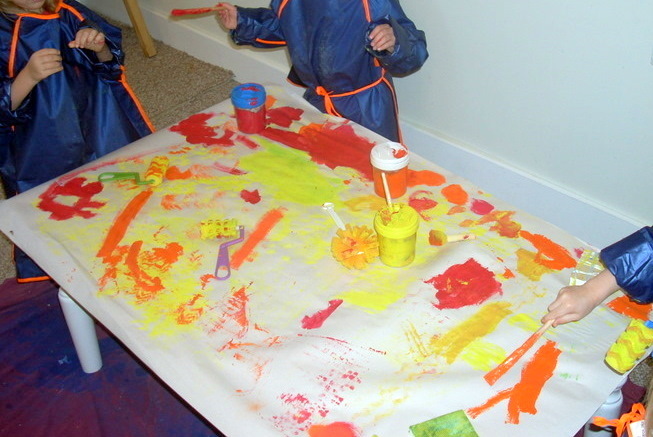 Repeat the activity again- or simultaneously if you have the room for two painting stations -using colors for the caterpillar’s head and feet (red, orange, and yellow). Once your paper has dried, you have a paper palette, just as Eric Carle uses. You can then do one or both of the following projects using the paper your children have prepared together. Create a large mural for your room. Cut out oval shapes for the body, triangular legs, and so on, then attach them together to create one larger-than-life caterpillar. You could even continue the project and create a butterfly! You can also help the children to create individual-sized caterpillars on art paper. For older children, you might have them cut out the circles themselves. For younger children, I would cut out a collection of small green circles and large green circles, as well as small red circles, and large red circles. You can talk about the shapes, sizes, and colors as the children glue them to their papers to create their own caterpillars. They can also add other details with crayons. When doing this project, I like to have some of the paper we have painted cut into smaller sheets and available for the children to examine. I like to remind them that this is their paper. I point out some of the textures and talk about how they created them. I also like to have the paper available in case someone wants to create something other than the circles I have prepared. You can’t get in the way of creative ideas when you’re doing a creative activity! While exploring Eric Carle’s art, I also like to take the unique tools to the easel and let the children experiment and create their own paper for individual creations. Eric Carle’s style of art is so appealing and inviting for young children. 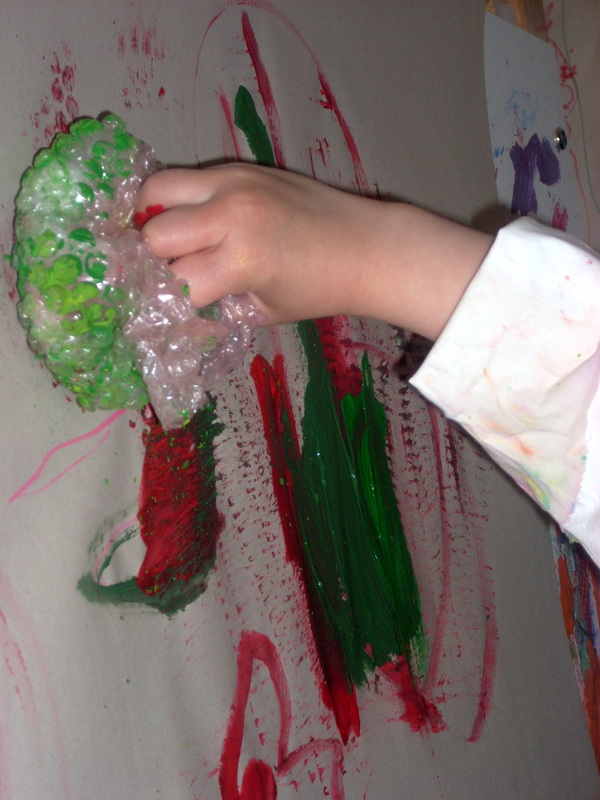 It encourages them to explore and use their creativity, along with their small and large motor skills. As the children become more familiar with Eric Carle as an author and illustrator, they not only gain an appreciation for his work, but they build cognitive skills as they recognize details and similarities that help them to categorize books. At the heart of this activity is the objective that the children will have an enjoyable, hands-on experience with literature, which will build language and literacy skills as well as a positive attitude about reading. And odds are, if a child loves to read, that child will learn to read. Oh, this would be huge hit with Chloe. She loves caterpillars. She still plays with her clothespin caterpillar we made last year. I bet the finger painting would be a hit too! Mandy this is great! I love eric carle! Have you explored Leo Lionni with you preschool yet? Book author Vivian Paley wrote in one her books how she spent a whole year in her early childhood classroom exploring the books of Lionni and had the kids express the stories in art and act the books, really cool! Leo Lionni would be fun! Great art and perfect for character education as well! Vivian Paley is a master teacher! I’d love to see what she did! This is a wonderful set of ideas!! Thank you, Deborah! It is a really fun project! I just have to tell you that i am so inspired by all the activities on your blog! I am a former elementary school teacher and now at stay-at-home mom to my 2 1/2 yr old son. Today we put together a sensory bin, and my son played with sand, digging and finding lizards that i buried. It was wonderful to watch. Thank you!!! That really means a lot to me Susan! Thank you so much for sharing! This is beautiful!! I can’t wait to do this during the school year! where can we get such a large sheet of paper? Is that one large sheet or several? THis is wonderful and I would love to try it. I actually used remnant newsprint from a local newspaper press. They sell rolls for cheap (free in some places). It doesn’t keep as well as art paper — tends to yellow and stiffen a little over the years, but it’s worked great for me. I still have one hungry caterpillar up on the wall from over a year ago. I do use several widths to layer and completely cover the table, but the roll itself is probably 2 1/2 feet wide, so it gives a great canvas space to work on!